Halloween Costumes for Cats? Count me in! We've seen plenty of baby costumes, dog costumes, and even halloween costumes for random objects like mailboxes and shrubs. But halloween costumes for cats!? You can't possibly get any cuter than this! Sit back, relax, grab a handful of halloween candy (we won't tell!) and feast your eyes on some serious feline adorableness! Halloween is just around the corner and here's your chance to outfit your favorite furry friend in some of the cutest halloween costumes we've ever seen! Don't cross this bat-cat's path on halloween or you might get struck with the curse of 100 nights of candy! Think of future dentist's bills, people! 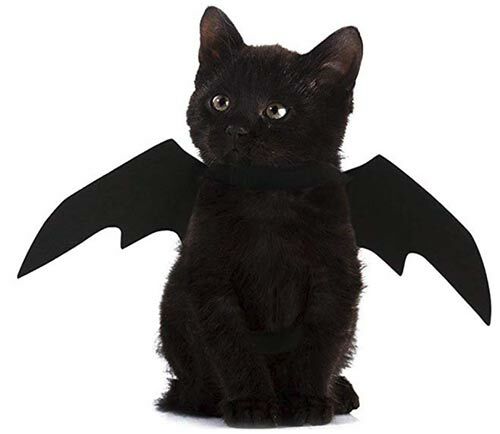 If you or your kids love Batman, this is an awesome bat cat costume that will certainly make halloween a little spookier! Perfect for the all-black cat that will be on the prowl for pets and dropped candy! 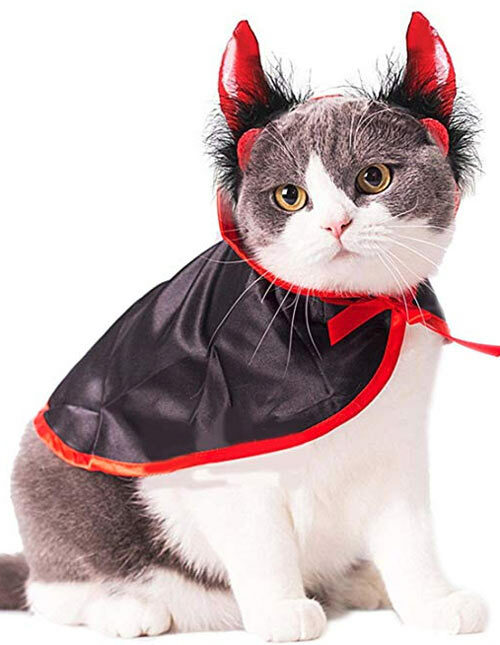 One of our favorite all-time cat costumes is this amazing cape and horn combination costume with black and red velvet. If you ever find your cat getting into some mischief, this could be the perfect costume! Certain to spice up your halloween evening and only like 15 bucks! The Wicked Witch of the CatNip! This is really well-done, and if you combine it with a black cat you have yourself a truly amazing cat witch halloween costume in the making! 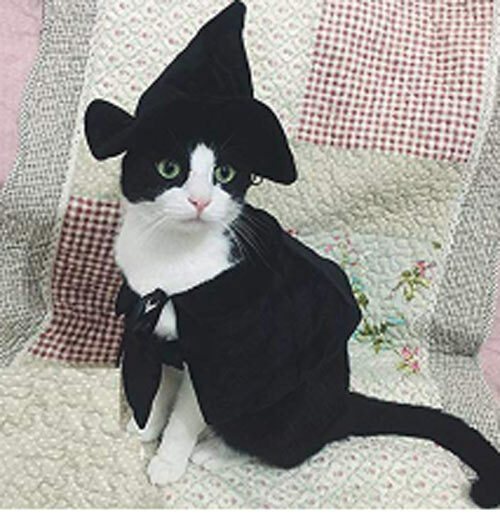 While we prefer not to try putting hats on cats (our cat Tiger hates them and rips them off within a minute), we simply can't resist this wicked witch hat! It really ties this costume together for the perfect witchy evening! Is this for real? We told you things were going to get seriously cute here. 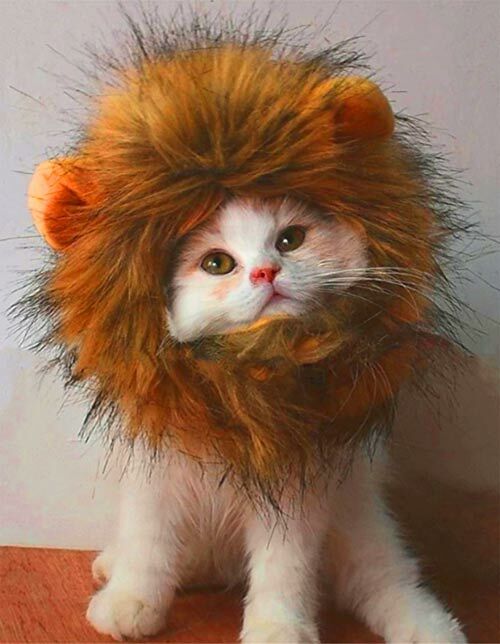 This Lion Mane Cat Costume is one of the most ridiculous and adorable things we've ever seen! This could work with a cat or even a small dog, but we definitely think it looks best on a furry feline, especially if that fur is lighter color! OMG I can't possibly! My daughter is obsessed with unicorns and this was her top pick for this halloween. I used to feel bad for Tiger (our cat) when he got put in a costume, but he gets so much love and attention when he looks this adorable! And after 8 years of costumes, he's totally used to it. 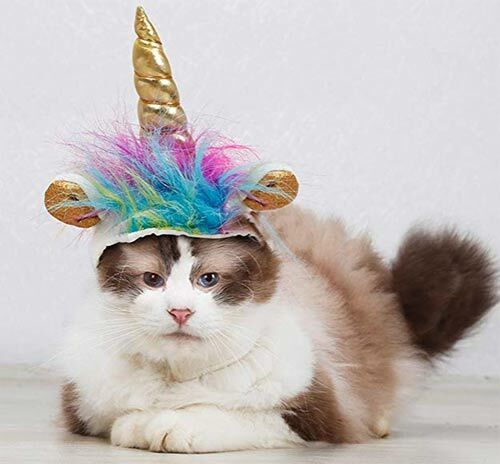 This unicorn cat costume is one of the most adorable things you can possibly find, with its rainbow colored mane and its golden spiral horn. And if you have a child as obsessed with unicorns as my daughter is, you're bound to make someone's dreams come true! There's not much funnier than the way these costumes fit your cat. They slide up the front legs and over the head and make their front legs and chest look like a human body. And when your cat starts walking around, that's when hilarity ensues! 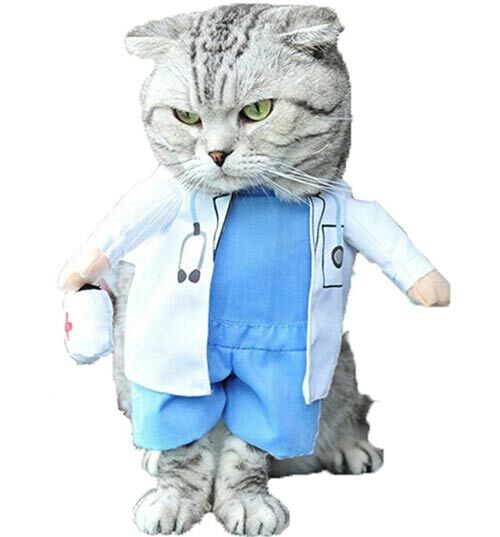 These doctor cat costumes are perfect for Doc McFluffins! Disclaimer: This costume will not turn your cat into a licensed health professional and we encourage you to seek professional support if you're inclined to trust your cat's medical advice. OMG are you furreal? 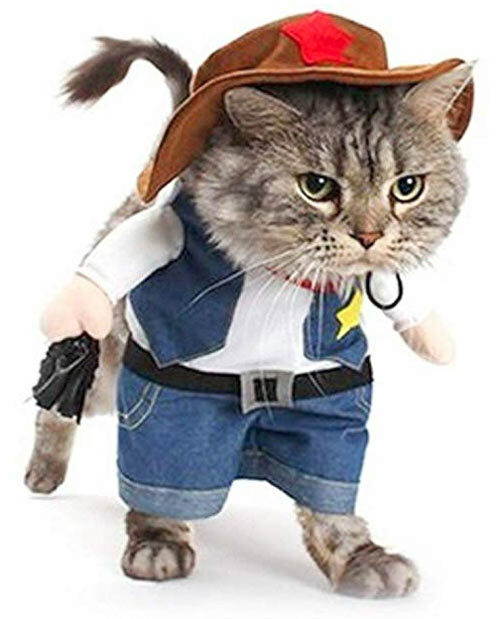 This cowboy cat costume will make your adorable little furball look like a real cowboy with its jean vest and pants, red bandana, and awesome brown hat. We can't promise your cat will let that hat stay on its head for very long, but maybe long enough to snap a picture! 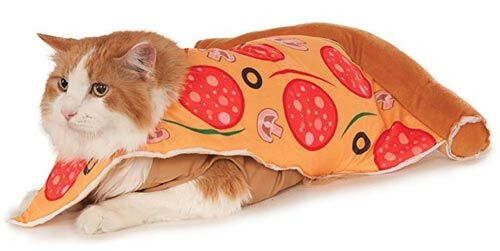 This is a great cat costume for any time of the year, and a perfect costume for a pizza party! Nothing says halloween like take-out pizza and a giant stash of candy dumped on your child's floor! Sneak a slice of pizza and a handful of candy and nobody will notice, right? Right! ?